Virginia Academy of Clinical Psychologists (VACP) is the voice of professional clinical psychology within the Commonwealth of Virginia. Its purpose is "the advancement of Clinical Psychology as a science, as a profession, and as a means of promoting human welfare by developing and encouraging high standards of ethics and training; by providing the opportunity for the exchange of experience and research through discussions, presentation and publications; and by educating the public in the purposes and goals of the art and science of the practice of clinical psychology for the promotion of the public welfare. 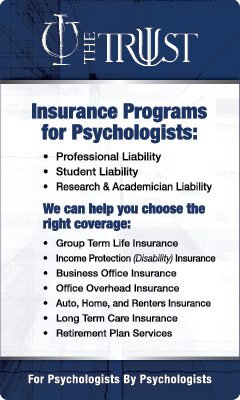 Beginning Jan. 1, 2019, there are new billing codes for psychological and neuropsychological testing services. The current codes, 96101-96103 and 96119-96120, were eliminated after Dec. 31, 2018. In the interest of your patients and practice, be sure to stay up-to-date on these changes. As a member benefit, we have posted the APA webinars and helpful supporting documents here.